The year was 793. 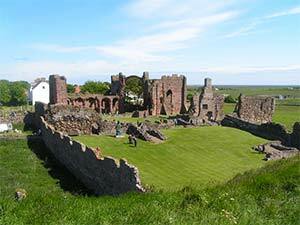 The Holy Island of Lindisfarne lies of the northeast coast of modern England, but in the 8th century it was part of the Kingdom of Northumbria, a territory that stretched from Yorkshire to Edinburgh. Earlier, in 635 a mission from the Abbey of Iona in the west of Scotland, led by St Aiden, established a monastery on the tidal island; and it became the evangelical centre for the Celtic Church in this powerful Anglo-Saxon realm. It would be home to the famous St Cuthbert, and was where the historian, the Venerable Bede would write his chronicles. Medieval monasteries were beacons of light during the Dark Ages; places of learning and study, religious teaching and seats of subtle political power. As such they were patronised by kings, gaining vast revenues and lands as a consequence. Many were laden with gold and silver, while others held priceless treasures like manuscripts and saintly relics. Poorly defended, and often coastal, they were soft targets for anyone raiding from the sea; and with the attack on Lindisfarne in 793 by the Norse a new chapter in Scotland’s story was begun – the Age of the Vikings. Scandinavia in the middle ages was a patchwork quilt of semi-kingdoms, ruled over by opportunistic warlords. Like most of northern Europe its economy was based on farming and fishing; but unlike the rest of the continent the Norse hadn’t yet converted to Christianity and this hampered trade relations with traditional markets. 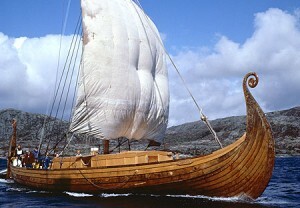 This in turn may have precipitated the dramatic development in sea craft and boat building techniques allowing them access to new markets. A population expansion at home seems also to have placed pressures on resource availability, especially along the fjord coast of Norway; which in turn led to a period of instability. This, plus a myriad of reasons collective and personal, resulted in raiding parties crossing the North Sea by the end of the 8th century. These fierce raiders were known as ‘Vikings’; a Norse verb that meant literally to ‘go raiding’; the raiders themselves were the Vikingr. The Vikings don’t relate to a specific ethnic group, rather it describes the activity and those doing it. However, in the British Isles the term became synonymous with the Scandinavian people generally. 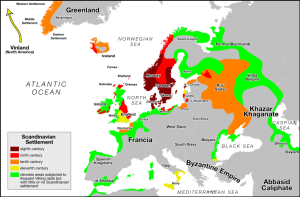 Over the course of the next 500 years the Viking Norse would extend their rule and influence from Moscow to Africa, Ireland to North America; but the main group to affect Scotland were the Norwegians. The story of the Vikings in Scotland is complex and changes through time and space, and coincided with the formation of the early Kingdoms of Scotland and Norway. There were various stages from raiding to conquest, from settlement and integration to collapse and withdrawal, but the legacy is massive and the influence reaches to our own time. Following the surprise attack on Lindisfarne in 793 the Vikings then hit the mother abbey on Iona itself a year later; wreaking havoc. Iona was part of the Gaelic Kingdom of Dalriada, which was itself a subordinate realm to the Kingdom of the Picts in the east and north. It was unable to cope, or come to Iona’s defence, and so the Vikings came again and again, including the great slaughter of the monks in 806. Dalriada had once been an extensive sea kingdom, linking the coastline of Argyll with the fertile lands of Ulster through a network of islands and sea lanes; and the Viking warlords saw the true potential here of combining their nautical abilities with this natural crossroads. They had already established a strong bridgehead and base on the Orkney and Shetland Islands, and the Hebrides would provide them with a fertile platform to continue their raiding into the Irish Sea; and to Ireland itself. The west coast landscape of island and fjord was also similar to their homeland, which must have been a further attractive feature in securing this area. Throughout the first half of the 9th century more and more Norsemen, and women, were settling out the Hebrides, Orkney and Shetland; in some cases replacing the local population and removing all trace of native languages. These were no longer the wild warriors coming in on the morning tide, pillaging and heading home. These people were here to stay. This created tensions with rulers in the rest of the country. In 839 a Norse army defeated a combined Gaelic-Pictish army somewhere in central Scotland: a disaster that allowed the MacAlpine dynasty to fill the vacuum created; and forge a union between Dalriada and Pictland to form Alba, the embryonic Scotland. Unification was also sweeping across Scandinavia. In the 870s Harald Finehair consolidated the various Norwegian estates into one single kingdom; and in 875 he annexed Orkney, Shetland and the Hebridean Islands to his crown. The greatest hour of the Viking Age in Scotland was dawning. Orkney was raised to a great earldom, befitting its prized strategic location, and under the rule of powerful earls it was at times semi-autonomous, extending its authority all the way down the west of Scotland to the Isle of Man. The Hebrides were more of a loose confederation, nominally controlled by Norway, but often pulled between the lordships of Man and Orkney. Yet the islands of Argyll, particularly Islay played a significant role as a base by which the Norse could shore up their rule in Ireland and launch attacks on Alba. By the 10th century the Norse throughout the Hebrides and parts of the Mainland had settled, intermarried, exchanged language and culture and had become the native stock; known as the Norse-Gaels. To the Irish and the Gaelic speakers of the Highlands they were the Gall-Ghàidheil, or the ‘foreign Gaels’. 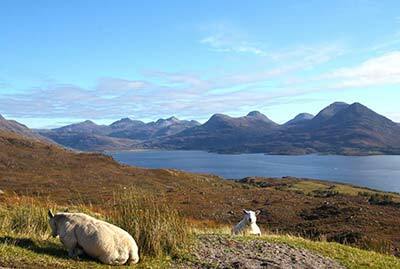 Even today the Hebrides are known as Innse Gall in Gaelic, meaning the ‘Islands of the foreigners’. This mixed group were clearly seen as being of different heritage and language; and contemporary chroniclers in Ireland and England identified them as a population differing from the Gaels and Norwegians equally. This enigmatic group are the ancestors of the Gaelic speaking Hebridean peoples today. By comparison, the Northern Isles of Orkney and Shetland were fully Norse in manner, custom and law; having been thoroughly settled from early on, and by the middle of the 10th century the mighty Earldom of Orkney included large tracts of mainland Scotland as well. This was the high water mark of Viking Scotland. In the south a new star was rising. Throughout the 9th and 10th centuries the Anglo-Saxon kingdoms of England had toppled like dominoes to the Viking Danes, who established a huge empire centred on York. The Scottish kings took advantage and snatched Lothian from Northumbria. The Kingdom of Strathclyde, having too been battered by Vikings and Scots alike was assumed into the ever growing country; and by 1050 the Scots had even forced the Norsemen from Sutherland and Caithness. In 1058 Malcolm III became king; and his dynasty, the Canmores, had but one ambition: to build their rule and territorial holdings to the greatest extent possible. It would put his descendents on a collision course with the powerful insular Viking lords, with far reaching consequences.